This is a quick, inexpensive, and easy way to get a bunch of smaller (Usually under 9 inch) pieces of cork. We started selling these bags at reptile expos, and due to the popularity we're offering them online. These cork packs are perfect for those looking to do small custom background jobs, or those needing smaller pieces for decor items & grow-out enclosures. Sold by the stuffed gallon bag, averaging roughly around 10-14 pieces depending on size. Assorted pieces only at this price. 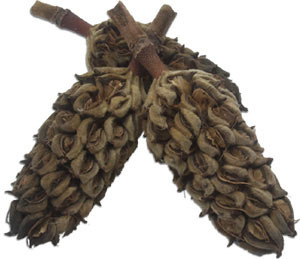 Seed pods from the Caro Caro tree (native to tropical South America) that add a touch of realism to your vivarium's floor. Sizes range from 2.5-4". Note: Some of these have the tendency to straighten out in extremely wet/humid conditions! For humid (85%+ R/H) enclosures, we suggest placing them in the driest area possible. Neat little assortments of our high quality Ghostwood decor! These are great for basic accent decor, mounting in custom backgrounds for added detail, and are also perfect for grow-out enclosures. Like all Ghostwood, these pieces will grow considerably darker once wet, and are a perfect choice for live vivariums. Available in packs of 3, 5, and 10, with lengths of each piece ranging from 4in to 6&half;in+. Limit 10qty per order at this price! A Glow-in-the-dark Mushroom Kit has many natural functions and is not only cool but plays a very important role in your terrarium's micro-climate by releasing humidity and purifying the environment. Each kit includes everything needed (except the log!) to grow your own Panellus stipticus mushrooms. You also get a wonderful booklet that tells you more about the science behind bioluminescence, its lore, other species, and its place in nature. Enough spores are included to inoculate a 6-12in piece of wood, 2-4in in diameter. After inoculating wood decor, it will take approximately 2-3 months before the log will start growing mushrooms, but it will continue to grow mushrooms occasionally for 2-3 years. Instructions included. 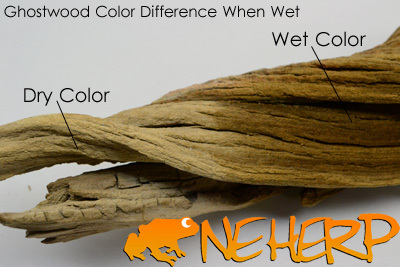 This is a new product to NEHERP by customer request, so please let us know what you think of it! From what we're told, we'd recommend Ghostwood or Malaysian Driftwood for this purpose, and using moist/wet established wood is best. Cork is dense enough that it takes forever to break down, and may not be the best fit. A neat decor item for live vivariums. Resists breaking down long-term and acts as a great refuge for springtails & other beneficial microfauna. Limit 20qty per order at this price! 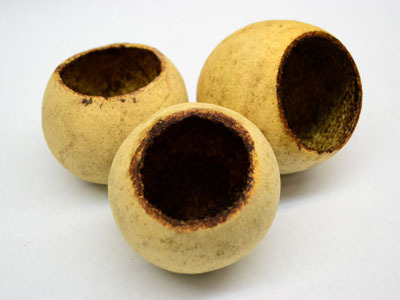 Monkey Pods are one of the most sought after wood vivarium accent items. Long lasting in even very humid conditions, these add a great touch of realism to any vivarium's floor. Sizes range from 2"-3". 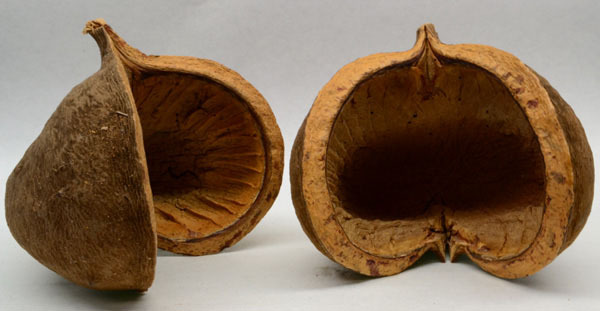 Also referred to as "Monkey Pots", these larger pods can be used as a hide, water bowl, or even as a planter in some larger terrariums. A very realistic addition to any tropical style vivarium build. Sizes range from 5-7". There are a handful of different names we've heard for these, but we commonly refer to them as seed pods. These usually hold water, and can be used in a number of ways. Some smaller species will use these as a hide, and some people use these as little planters mounted in background work. Sizes range from 2.5-3.5". A fairly popular vivarium decor item; larger split pods are another completely natural way to make your vivarium even more realistic. Sizes range from 4-5.5".